Gewurztraminer may - if the vineyard is optimal - mature with great dignity. Then the perfumed scent fades, and the high natural sugars melt down to become volume and body. Bollenberg in Orschwihr has a perfect micro-climate which allows the grapes to reach aromatic maturity before the sugar content becomes to high and the acidity too low. 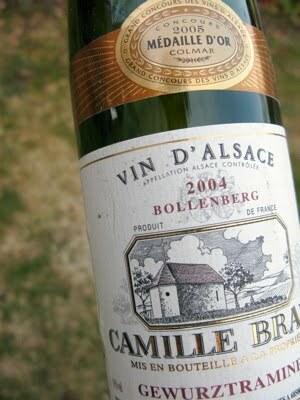 2004 Gewurztraminer Bollenberg has an amazingly youthful, greenish color. The scent is a purebred, typical palette of ripe yellow apples, a little banana, hyacinth and ginger. The spicy taste is perceived to be dry with some salty licorice and silky but firm acids. A superbly balanced wine with only 7 grams of residual sugar and 4.5 g total acidity. Price: € 6.